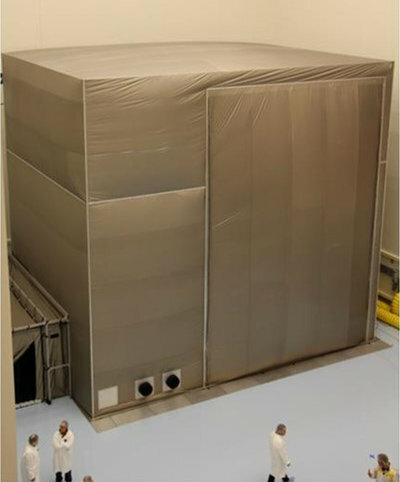 Canandaigua, NY USA: Select Fabricators, Inc.’s (SFI) newly patented, large scale EMI / RF shielded test enclosure allows SFI to build modular rooms/enclosures that will shield at the highest levels. Focused on minimizing leakage, improving setup time, as well as providing a solution that can be transported or stored after project completion, SFI developed the patented (US Pat. No. 9,930,816) large-scale modular design. The internal framing is a free-standing, weight bearing, aluminum channeled, post and beam frame which is custom designed to meet the project specifications and sizes. This internal frame will support the weight of port plates, vents for both intake and exhaust, the modular fabric paneling, and RF anechoic foam panels. The patented design also includes a method to conductively connect every frame member in the system. The removable panels of this design is made from NovaSelect™ conductive silver/copper/nickel fabric, externally coated with an acrylic that minimizes particle shedding and metal plating breakdown, RoHS compliant, and is cleanroom Class 10,000 compatible. Each panel can be removed from the internal aluminum frame for access to the test space as well as accommodate the installation process. Every modular panel has stainless steel grommets installed around the outside perimeter to allow for stud/clamp connection to frame system and aluminum panel floor system. Because each panel is conductively connected to each other, the equipment door does not need a threshold and heavy items can be easily rolled in and out. The large equipment single door / double row flexible magnet seal (using SFI’s patented door seal system, US Pat. No. 9,029,714) is a separate attachable panel including an aluminum bar clamping system to prevent unintentional opening during equipment testing. For large and heavy equipment under test, the new temporary screen room design includes an aluminum sheet ground plane system which is also conductively connected to the frame and modular panels while allowing heavy units to enter and exit without damaging the enclosure or the conductivity. The floor panels use a rabbet edge design and are connected together with an EMI gasket and flush-mount clamping bar. The perimeter floor plates contain hardware for clamping the tent’s modular fabric panels and establishes the RF tight seal. In order to enter or exit the screen room after the main equipment door has been secured, man-doors and/or an external anteroom can be added. The external anteroom is also a control room for equipment during testing procedures. The anteroom can be sewn onto and permanently attached to a modular panel connecting to modular panels, internal frame and aluminum ground plane floor. The anteroom frame is designed to be removable which allows the anteroom to be accordion folded towards main chamber which helps minimize the test enclosure’s footprint when not in use. External anterooms include SFI’s standard conductive fabric floor with heavy duty vinyl protective layering on top and bottom. All four walls and ceiling inside the anteroom can be covered with lightweight fire barrier material. Encased to prevent shedding and comply with ISO Class 7 (Class 10,000 –Fed. Std. 209) cleanroom specifications, the anechoic foam panels are designed into the modular system at discrete places to assist in absorbing unwanted reflection in the paths of the test antennas. These RF absorbent foam panels are installed using the prepositioned horizontal chair rails in the frame system. This new, semi-permanent, patented system design can cost significantly less than bids received for a permanent welded chamber of the same size. Installation can take one week with another week for testing, which can be a full month quicker than typical installation time for permanent welded chambers. At a 10:1 weight ratio to a welded screen room, the ability to move the RF shielding fabric enclosure to a new location is both cost and time efficient adding to the value for the end-user. “SFI is thrilled to be able to offer this new patented design to our customers and save them time, space, and money.” Select Fabricators’ CEO, Tim Ansaldi, had to say about the new design. “We believe that this product is applicable to many industries, but especially to test and research labs.” added President, Andrew Pluta. Select-A-Shield™ RF / EMI products are ideal for numerous applications including wireless device development and testing, secure communications, EMC pre-compliance, medical and aerospace equipment shielding, cellular and computer forensics, and RFID shielding for commercial and industrial settings. Founded in 2000, Select Fabricators, Inc. excels in the development of RF / EMI solutions including shielded enclosures, pouches, and curtains, as well as the procurement of state-of-the-art materials, research, design, manufacturing, fulfillment, and production to stringent quality standards with complete project management. With capabilities including industrial sewing, heat sealing, ultrasonic welding, pad printing and cleanroom operations, SFI delivers a wide array of solutions to the aerospace, forensics, homeland security, law enforcement, industrial, medical, military and wireless communications industries. Select Fabricators, Inc., a privately owned company, conveniently located in Western New York. SFI’s main facility consists of over 19,000 square feet of flexible manufacturing, warehouse, and office space with a Class 10,000 Fed. Std. 209 ISO Class 7 cleanroom and Class 100 Fed. Std. 209 ISO Class 5 curtained area. Please feel free to reach out here to request a quote or any additional information. Offer for us the portable shielded room (4x3x2.5m). Price and technical parameter. Thanks.